Do you have a large empty wall space outside of your office building or commercial property that is just begging for some life? It can be difficult to find the right decorative touch for a space like this, but you can find the perfect solution by working with Foliage Design Systems Atlanta. We are an experienced interior landscaping company that specializes in installing and maintaining living walls that can really brighten up a space. Our vertical gardens can be as colorful as you want them to be, and by taking the initiative to have a commercial green wall installed, you will be beautifying your space and improving air quality for your employees and customers. 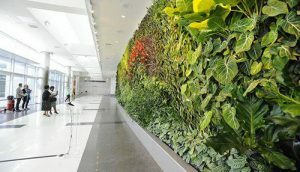 At Foliage Design Systems Atlanta, we work directly with a company called GSky to install eye-catching vertical gardens. If you decide that you want to have a living wall installed, we will visit your commercial space to inspect the area and help you decide on the types of foliage we will use, as well as the overall design of the wall. In some cases, companies choose to go with commercial green walls filled with nothing but greenery. In others, a pop of color is requested. There are even amazing designs that can be worked into your exterior green wall when you work with a skilled and experienced company like Foliage Design Systems Atlanta. Outside of serving as a cool decorative feature, green walls can also provide you with many other great benefits. As mentioned, they can improve the air quality surrounding your commercial space. They can also be used to cover up unsightly blemishes on a wall. When cared for properly, a vertical garden or exterior green wall can last for many years and evolve along with your commercial property. Foliage Design Systems Atlanta can take care of this for you by coming out and performing regular maintenance, allowing you to enjoy the benefits with none of the hassle. 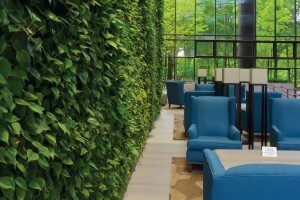 Regardless of what attracted you to the idea, commercial green walls are great features to have. Reach out to Foliage Design Systems Atlanta at 770-451-0885 today to inquire about installing living walls at your place of business.